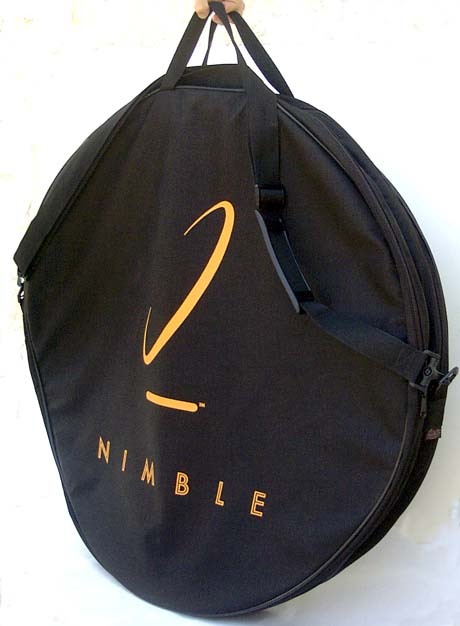 Nimble's single sized heavy weight 600 denier wheel bag is a durable low cost solution to fit both 650C and 700C sized individual wheels. This bag has extra stout back pack style fabric and handles, but unlike the original style bag it does not have a reinforced center or accessory pocket. This wheel bag is recommended only for hand carry. This bag does not protect for shipping or airline baggage handling. 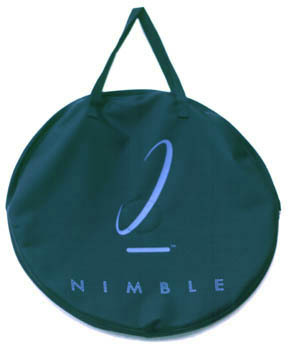 2004 single wheel bag is offered in both Nimble orange and Nimble periwinkle. Also see price. This bag features extra heavy reinforcement over a light weight plastic shell, an 1/8 inch outer foam cover, and a 2 inch central foam wheel separator between separate wheel compartments. Each compartment has a durable lining. Edges are gusseted. This wheel bag is recommended only for hand carry. This bag does not protect for shipping or airline baggage handling. We recommend a hard case for travel. Double padded wheel bag is available in Nimble orange. Also see price. 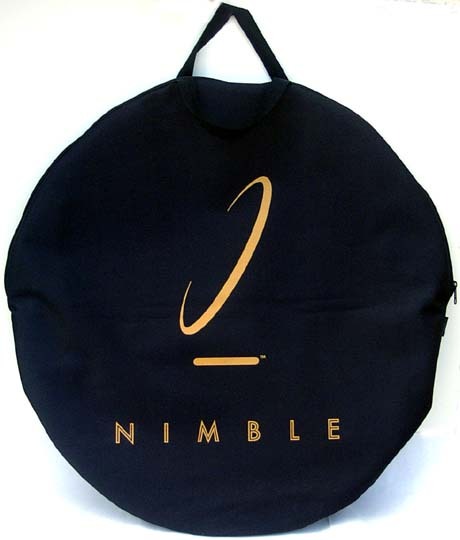 Nimble's original heavy weight 600 denier wheel bag is available in 650C single and set configurations. This bag has a reinforced center and offers an inside zip pocket for quick releases and accessories but is not padded. These bags offer an extra length heavy duty handle strap that accommodates shoulder carry. Double bags feature a foam spacer to hold hubs and separate CROSSWIND wheel pairs. Bag edges have reinforced gusset. This wheel bag is recommended only for hand carry. It does not protect for shipping or airline baggage handling. This bag is available in Nimble periwinkle. Also see price.